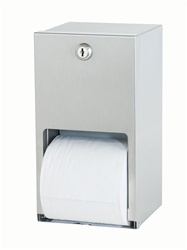 The Bradley 5402 Surface-mounted dual roll toilet tissue dispenser shall be heavy gauge satin finish stainless steel. Cabinet holds two rolls of 4�" x 5" standard core toilet tissue, one above the other. When first roll is used up, a fresh roll automatically drops down for use. 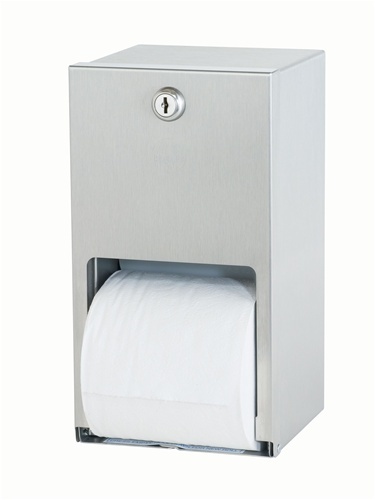 The Bradley 5402 uses a unique retaining mechanism prevents use of spare roll until first roll is completely used. Spindles non-removable by user. Hinged door permits access to storage compartment for servicing of unit.